Google is taking steps today to help businesses secure the Android platform, allowing the over 1 billion people in the world with an Android smartphone to bring their devices to work. Called Android for Work, Google has partnered with multiple companies specializing in their fields of expertise, in hopes to make Android a better OS for the workplace. Android for Work is built with four main components, being Work Profiles, the Android for Work application, Google Play for Work, and Built-in Productivity Tools. To start, employees will dedicate a work profile to their smartphone (must be running Lollipop), and will then have access to secured data on a network thanks to default encryption and enhanced SELinux security enforcement. “IT can deploy approved work apps right alongside their users’ personal apps knowing their sensitive data remains secured. People can use their personal apps knowing their employer only manages work data and won’t erase or view their personal content,” as explained in Google’s blog post. Following the setup, the Android for Work app (for devices running Ice Cream Sandwich through Kit Kat) allows users without access to work profiles to see secure work emails, calendar appointments, contacts, and documents. All of which is completely manageable by IT. Current hardware partners are listed as Samsung, Sony, LG, Motorola, HTC, Lenovo, among others. Application partners are Box, SalesForce, Adobe, SuccessFactors, and others. For a full list of partners on the Management and Networking side of things, check out Google’s full blog post. 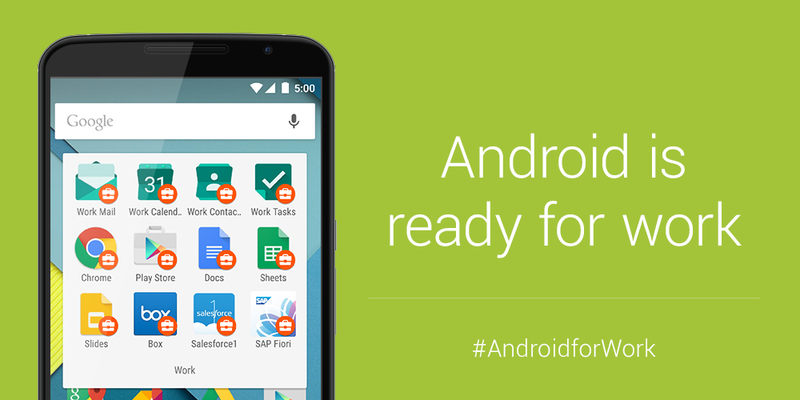 To get yourself or your employer involved, check out Android for Work. Work profiles – We’ve built on the default encryption, enhanced SELinux security enforcement and multi-user support in Android 5.0, Lollipop to create a dedicated work profile that isolates and protects work data. IT can deploy approved work apps right alongside their users’ personal apps knowing their sensitive data remains secured. People can use their personal apps knowing their employer only manages work data and won’t erase or view their personal content.